European Union (EU) Environment Ministers are meeting in Dublin next Monday and Tuesday to advance policy discussions in the areas of air quality and climate change. The UK Government is expected to lobby for weaker public health protections despite 2013 being the ‘Year of Air’. The European Commission (Commission) declared 2013 to be the ‘Year of Air’ in January 2011. It decided air pollution needed to be considered holistically after considering the need to update the National Emissions Ceilings Directive (NECD) and its duty separately under Article 32 of Directive 2008/50/EC on ambient air quality and cleaner air for Europe to ‘review the provisions related to dangerous airborne particles (PM2.5) and, as appropriate, other pollutants, and [present] a proposal to the European Parliament and the Council [of Ministers]’. Commissioner Potočnik launched the ‘Year of Air’ at a major event in Brussels on 8 January 2013. He highlighted the Commission’s latest estimates of 420,000 premature deaths from air pollution in the EU in 2010 and that two-thirds of the Natura 2000 network of protected sites is currently affected by eutrophication from air pollution. recent studies show associations between PM2.5 and mortality at levels below the current Air Quality Guidelines (AQG) fixed at 10 micrograms per cubic metre (µg/m3) annually and so the WHO review recommends a revision of the AQGs for PM by 2015. The report also recommends further modifications to EU law, as the current limit value for PM2.5 in Directive 2008/50/EC is twice as high as the AQG recommendation. the WHO review found new evidence for effects of long-term exposures to ozone (O3) on respiratory mortality and on deaths among people with predisposing chronic conditions. This adds to previous findings on short-term effects which are the focus of current regulation. An impact of ozone exposure on cognitive development and reproductive health, including preterm birth is also suggested. The review recommends the development of AQGs for long-term average ozone concentrations. a new AQG was also recommended for nitrogen dioxide (NO2), a toxic gas produced by the combustion process in heating, power generation and especially vehicle engines. New studies have associated short- and long-term exposure to NO2 with mortality, hospital admissions and respiratory symptoms at concentrations at or below the current EU limit values (which are set at the same level as the AQGs). The REVIHAAP report also drew attention to the WHO’s classification in June 2012 of diesel exhaust as a class one carcinogen for humans. Policy Exchange estimated, in its report titled ‘Something in the Air: The forgotten crisis of Britain’s poor air quality’ that diesel vehicles are responsible for 91% of PM2.5 and 95% of NO2 exhaust emissions from road transport in London. On 1 April 2013, Health and Wellbeing Boards (HWB) were established formally in the UK under the Health and Social Care Act 2011. Laudably, the HWB have been provided with Public Health Indicators by the Department of Health (DoH) including Air Pollution 3.1 under ‘Health protection’. DoH published in 2012 the attributable fraction (i.e. the percentage of deaths attributable to long-term exposure to PM2.5) for every local authority in England and Wales. Very oddly, they have still not published the other metrics recommended by the Committee on the Medical Effects of Air Pollution (COMEAP) namely the number of attributable deaths and the total years of life lost for each such local authority. The omission is particularly odd since the calculation can be done in few minutes once the percentages are known (as they have been for months) – perhaps Ministers want to hide the estimates after the media coverage the ‘percentages’ received in London. CAL is aware of no HWB, other than the City of London Corporation, prioritising air pollution in its Health and Wellbeing Strategy even though air pollution is the biggest public health risk after smoking. Air pollution near our busiest roads is twice or three times WHO guidelines and legal limits. Levels of NO2 in London are the highest of any capital city in Europe. But this is not just a London problem. The UK has the highest proportion of zones exceeding the NO2 annual limit value plus margin of tolerance of any country in Europe. CAL also found the Government told the Commission in September 2012 that the population weighted annual mean level of PM2.5 in the UK increased from 12.5 μg/m3 in 2009 to 13.0 μg/m3 in 2010 and 13.5 μg/m3 in 2011. This gross failure to protect public health should trigger a requirement under Directive 2008/50/EC to a 15% reduction in population weighted PM2.5 between 2010 and 2020 (as Annex XIV sets exactly 13.0 μg/m3 as the threshold for 15% not 10% reductions between 2010 and 2020). Defra is due to publish its annual report on air quality in April. CAL responded to a fast-track consultation by Defra late last year to object to it hiding further the UK’s air pollution problems by reducing, in amount and frequency, the information it publishes about air pollution. Clearly nervous about the forthcoming results, Defra published a pre-release on 14 February (link no longer available) which warned that new Daily Air Quality Index bandings, which are better aligned with health standards (other than for PM), would result in more exceedances being reported. London has had eight smog episodes already in 2013, two more than this time last year. Despite Government efforts to hide these problems, many people are concerned about air pollution. A Eurobarometer survey published in January showed: a majority (56%) of Europeans believe that air quality has deteriorated in the last 10 years; and seven out of 10 Europeans (72%) consider themselves unhappy with efforts by public authorities to improve air quality. When asked about the most effective way to tackle air pollution, 43% suggest stricter emission controls on industry and energy production. Emissions from vehicles (96%), industry (92%) and international transport (86%) are considered to have the biggest influence on air pollution. Impacts of air pollution on health and nature are also a cause for concern. Almost nine out of 10 Europeans believe that air quality-related diseases such as respiratory and cardiovascular diseases are a serious problem. Around eight out of 10 consider acidification and eutrophication as serious problems. the enforcement and strengthening of ambient air quality limit values. The UK had the fourth highest response rate to the consultation. A key overall theme emerging from the consultation was that the EU should tighten emission controls to assist compliance with air quality legal standards. There was little support for relaxing the standards or delaying compliance deadlines. A summary of the 1,971 responses to the Commission’s consultation on air quality policy shows clear majorities of the public, experts and national authorities support policies such as more stringent caps on member states’ air pollutant emissions. Stricter ceilings have already been agreed under the Gothenburg Protocol. Three quarters of stakeholders want targets for 2020 under the NECD to go beyond the new Gothenburg Protocol. But national authorities say they should not deviate too much from the protocol. There was ‘quite strong support’ among the public, civil society groups and experts for capping black carbon emissions through the NECD. Businesses were opposed while national authorities were split. Respondents also want action on other short-lived climate forcers such as methane. There was also strong support for introducing a binding air quality standard for PM2.5 for 2020. Only 17% of national authorities that participated in the consultation were opposed. The public, civil society groups and experts want air quality standards to be more closely aligned with WHO guidance, whereas national authorities propose lowering them once the EU has further reduced pollutant emissions. The business sector mostly favours maintaining existing standards. Political interest is also rocketing with the Clean Air in London Awards 2013 recognising amazing work by 24 individuals. These include: Barry Gardiner MP (Labour), who has built successfully understanding of air pollution among the parliamentary Labour Party; Robin Meltzer (Liberal Democrat) Prospective Parliamentary Candidate for Richmond Park, North Kingston and New Malden; several leading Greens; and three of the Mayor’s team in London. Last but not least, CAL spoke to a packed room at the Green Party’s Spring Conference 2013 organised by Jean Lambert MEP and Keith Taylor MEP and supported by Caroline Lucas MP. Meanwhile legal pressures are coming to a head. The Supreme Court heard ClientEarth’s case against Defra on 7 March 2013 to enforce NO2 laws and a judgment is expected imminently. Defra has admitted to the Court that the UK is breaching NO2 limit values in 16 zones and won’t comply with standards, in legislation since 1999 to be complied with by 1 January 2010, in 15 zones until 2020 and in London until 2025. ClientEarth has challenged the judgment of lower courts that legal remedies are for the Commission to pursue not the UK courts and insisted that Article 23 of Directive 2008/50/EC requires Member States to produce a plan to comply with these standards by 1 January 2015. Despite the strong scientific evidence and legal pressure, the UK Government has continued to downplay the health impacts of NO2, failing to mention that it is the only ‘modern’ molecule within the whole gaseous component of air pollution subject to WHO guidelines and legal limits. Whereas the particle component of air pollution is regulated by its total mass concentration, gases other than NO2 are largely ignored. It is vital therefore that levels of NO2 are reduced to avoid: its direct health effects and those of other toxic pollutants from combustion; and its contribution with nitrogen monoxide as a precursor to the formation of deadly particles. Sulphur dioxide, which is also regulated, has been largely eliminated as a problem by the use of ultra low sulphur fuels. Air pollution is also an equality issue. Policy Exchange has estimated that in the worst 10% of London for NO2, 5-10 year old children are 47% more likely than the London average to be eligible for free school meals and residents are 26% more likely than the London average to be on income support. A Government annual report to the Commission in October 2012 admitted 440,439 in people in London in 2011 (and 475,570 nationally) were living in ‘background locations’ where annual mean concentrations of NO2 exceeded legal limits. It has refused to calculate the total number including urban roadsides. In the past, the Commission has successfully taken Italy, Portugal, Slovenia and Sweden to Court for failing to ensure good air quality for citizens. But the Court rulings that resulted only covered the failure to comply with air quality limit values in the past, providing little incentive for Member States to act on future exceedances. A fresh approach is therefore being taken, enlarging the scope of the legal action. The aim now is to urge Member States with on-going air quality problems to take forward-looking, speedy and effective action to keep the period of non-compliance as short as possible. The Commission is particularly concerned with cases where non-compliance with EU law has lasted for more than five years and is forecast to continue in the future. Under EU law, Member States are obliged to take all the necessary measures to improve air quality, and to make this information available in form of air quality plans. Failure to do so will result in legal action. Previously, legal action against Member States failing to comply with air quality requirements was based on a breach of Article 13 of the Directive, which requires Member States not to exceed limit values. The new approach however also covers Article 23 of the Directive, challenging the failure of many Member States to establish specific air quality plans which should set out appropriate measures, so that the exceedance period can be kept as short as possible. Although the Commission has closed its case against the UK for breaching PM10 limit values in London in 2011 the media has reported it is still investigating CAL’s claim that the UK ‘cheated’ in reporting compliance for that year. 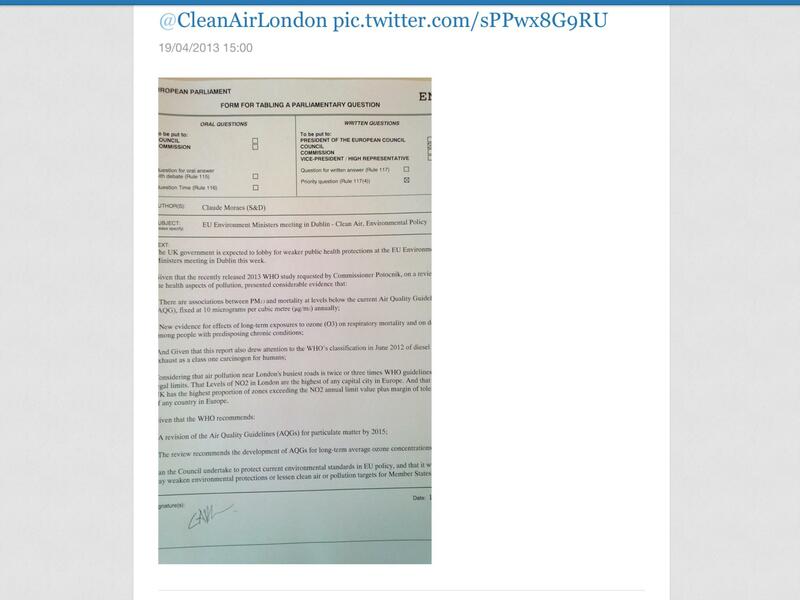 In particular, CAL has submitted video evidence to the Commission showing that air pollution monitors, for example in Neasden Lane in Brent, from which the Government refuses to accept results, show breaches of these public health standards. CAL also expects the Commission to prioritise infraction action against the UK for NO2 in 16 zones and has urged it to do so. It seems unlikely to act before the Supreme Court judgment. While pressure has been building to tighten and comply with air pollution laws, the Government and the Mayor have been lobbying to weaken these laws. The Government’s coalition agreement included the promise ‘We will work towards full compliance with European Air Quality Standards’. However, despite this promise, the Government has committed to ‘Working in partnership with other Member States, we will also use the European Commission review of air quality legislation, expected in 2013, to seek…amendments to the Air Quality Directive which reduce the infraction risk faced by most Member States, especially in relation to nitrogen dioxide provisions’. Similarly, the Mayor founded a group of 12 European cities and regions that signed a ‘Memorandum of Understanding’ on 10 November 2011 that emphasised ‘The revised [Air Quality] Directive shall include a degree of flexibility that allows the specific characteristics of our Regions to be taken into account’. The Mayor has shown, under questioning from Stephen Knight (Liberal Democrat) in the London Assembly, a distinct lack of commitment to complying with NO2 laws. We had a stark reminder of the seriousness of these issues earlier this month when CAL published a report on its investigation into the Government’s failure to control carcinogenic diesel exhaust. CAL found the widespread commercialised removal and tampering with diesel particle filters and emission control units designed to protect public health. A letter from the Secretary of State for Transport obtained by Clean Air UK and dated 14 February 2013 stated ‘Removal of a diesel particulate filter, whilst not illegal in itself, will almost certainly result in a contravention of the [requirement making it an offence under the Road Vehicles (Construction and Use) Regulations (Regulation 61a(3)) to use a vehicle which has been modified in such a way that it no longer complies with the air pollutant emissions standards it was designed to meet], making the vehicle illegal to use on the road’. Stephen Hammond MP told The Rt. Hon Andrew Smith MP this week ‘The Department’s officials have been asked to ensure that suitable advice [to motorists and repairers on the removal of factory-fitted DPFs from vehicles] is available on the Government website’. It seems a small number of right wing anarchists in the Government and the Mayor of London’s administration want all regulation and controls removed. These people and their philosophy are similar to those who took the world to the edge of a financial abyss in 2008. In any event, the facts remain, the Government has not introduced a single significant new policy to improve air quality since it was elected and the Mayor had none in his manifesto in May 2012. There is much at stake therefore at the informal Council of Environment Ministers in Dublin next Monday and Tuesday. Let’s hope the Irish Government proves its ‘greenness’. Will the UK Government succeed in weakening air pollution laws and stopping or slowing action needed to address the biggest public health risk after smoking? Or will the Irish Government prove its ‘green’ credentials (no pun intended) by pushing through new commitments to continuity and the tightening of health and legal protections on air pollution? Irish Environment Minister Phil Hogan stated on 15 April ‘Policies to address air pollution can bring important additional benefits to [climate change and biodiversity] as well as being an important public health protection measure’. Perhaps we will learn the outcome during an oral debate in the House of Lords on 24 April when Lord Dubbs (Labour) asks about ‘Action to improve air quality in London and other cities’. The pace of events in the ‘Year of Air’ will accelerate in May in the lead up to the Commission’s Green Week in Brussels on 4 to 7 June. Lithuania takes over the Presidency of the Council of the European Union between July and December. The Commission is expected to put forward its legislative proposals in Autumn 2013. These are expected to include European legislation to tighten air quality laws and reduce emissions e.g. targeting biomass, vehicles and non-road mobile machinery. The Commission may also propose ‘partnership agreements’ which could include enforceable commitments from Member States. NGOs are concerned however that such agreements may have the effect of weakening air pollution laws. It remains to be seen what and how quickly legislation can be introduced before there is a moratorium on new legislation in the lead up to the European Parliament elections in 2014.